Prototype: Interchange type Gms 30 "Oppeln" boxcar with a brakeman's cab. Privately owned car painted and lettered for the leather firm Gebr. Bader GmbH, Göppingen, Germany, used on the German Federal Railroad (DB). The car looks as it did around 1959. Magirus curved hood truck with a flat bed and drying racks with leather. 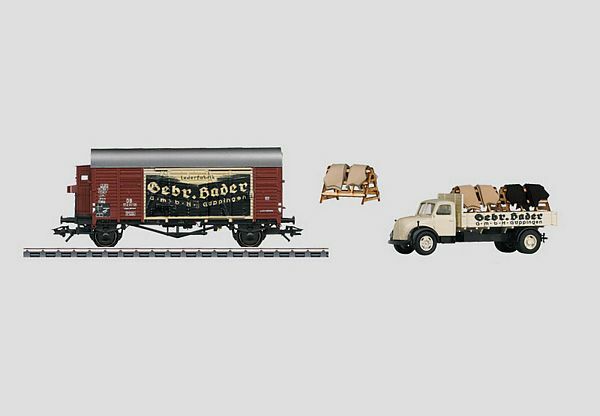 Model: This boxcar has truss rods and additional step boards and is painted and lettered for the firm of Bader, Göppingen, Germany. It is based on a historical theme. Length over the buffers 11.3 cm / 4-7/16. The truck model is constructed of a combination of metal and plastic. It is painted and lettered as a factory truck for the firm of Bader, Göppingen, Germany. It has a load of 2 drying racks made of real wood. Each drying rack has a triple layer of half leather cow hides made of real split leather. Truck length 8.2 cm / 3-1/4. DC wheel set 2 x 700580.